We get asked all the time what differences exist between the SpectraCal C6 and the ChromaPure Display 3 PRO. There is a lot of misinformation out there, so this article is meant to clarify the differences by providing only factual information without any 'marketing fluff'. When the i1Display Pro was first released the manufacturer (X-Rite) touted that it is up to 5x faster than their less expensive ColorMunki Display, so the same holds true for all versions, including the C6 and ChromaPure Display 3 PRO. Neither is faster than the OEM or retail i1 Display Pro since they are in fact the same hardware. They are identical in this respect. The only differences in speed will come from how the meter is supported in the software as the software can choose to slow things down to enhance repeatability. Unfortunately SpectraCal's comparison table on their site would let you believe that the C6 is faster then the stock i1 Display Pro (since they sell both) but that is misleading/incorrect as there is a trade-off between speed and repeatability at low light levels, so the extra speed isn't generally used. Edit: SpectraCal seems to have removed this table that said that the C6 was 5 times faster than the OEM i1Display Pro as the comparison obviously isn't correct. Many have done speed comparison tests between the C6 and OEM i1Display Pro (these are posted all over the 'net on various forums) to show there is no difference in speed. In some cases the C6 has been shown to be slightly slower, likely because of the way the software is using it to enhance repeatability to obtain better results. This is a good thing. So both meters are just as fast as the stock i1Display 3 which is very fast indeed. Neither meter takes advantage of the full 5x speed difference as compared to the ColorMunki Display. To do so would undermine the meter's repeatability and general usefulness. This is also a good thing. 2. Both come with additional accessories. The C6 comes with a hard case and a tripod extender-holder. The ChromaPure Display 3 PRO comes with a calibration disc of patterns, 10' USB extender cable, and a tripod extension. 3. 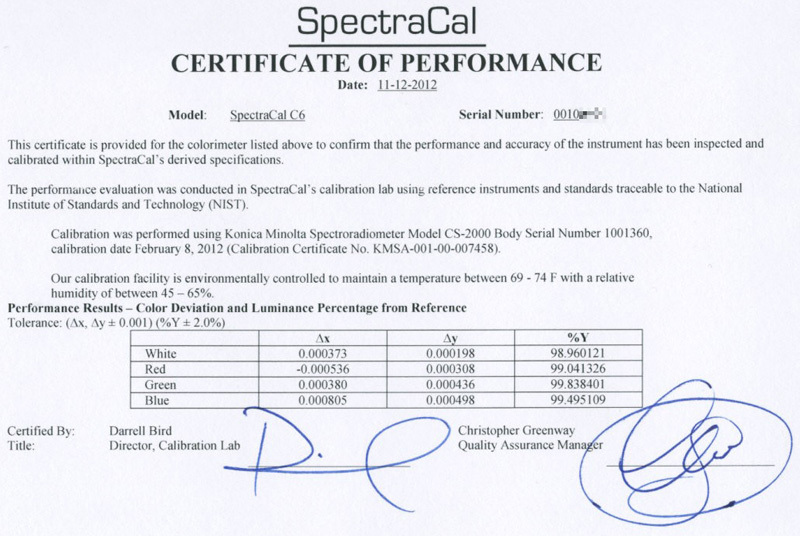 The C6 is locked to SpectraCal software. It will not function at all (it will not return any colorimetric data) with any other software package. The Display 3 PRO will work with any software that supports the i1 Display Pro. However, when used with software other than ChromaPure, you would lose the error corrections shown above, because these are built-in to the ChromaPure license file. With other software the ChromaPure Display 3 PRO behaves as a stock i1 Display Pro. 4. 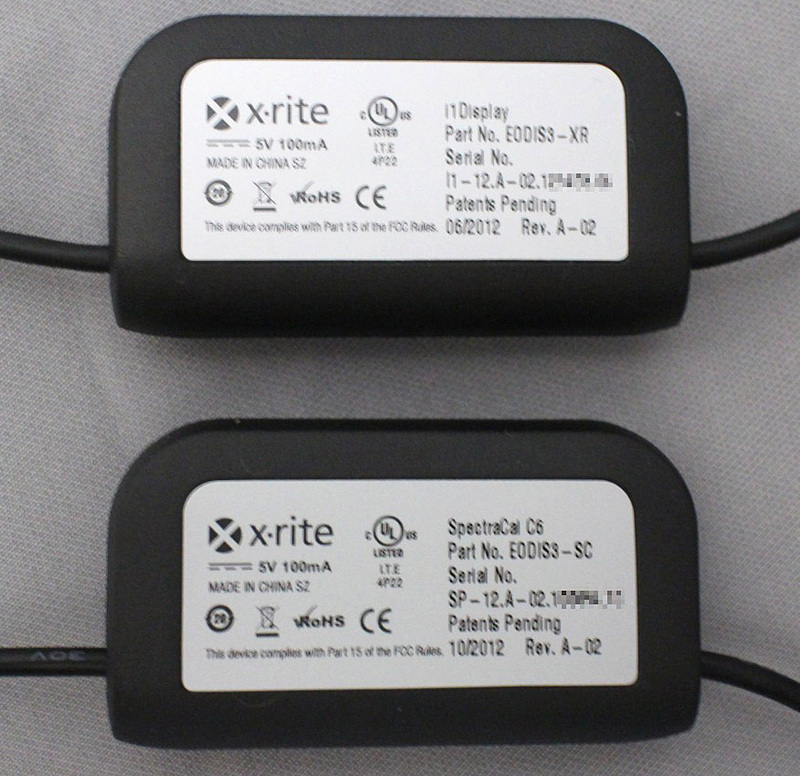 X-Rite (the manufacturer) offers custom labeling at added cost to any reseller who chooses to brand the stock i1 Display Pro meter to suite their needs. The C6 includes such custom labeling (the red stripes and "C6") to brand their meter, while the the ChromaPure Display 3 PRO does not to keep costs down. The Display 3 PRO looks like a stock i1 Display Pro. 5. The C6 is more expensive than the ChromaPure Display 3 PRO. Thank you for explaining the differences Kal.